Surcharges may apply for travel on a weekend. 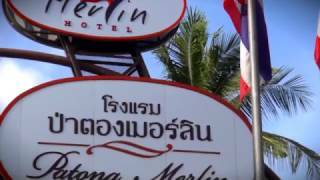 The Patong Merlin Hotel is an international holiday resort in the heart of Patong Beach – Phuket’s exotic area. Nestled amongst acres of swaying coconut palms and flowering gardens, the Merlin weaves its way around four beautiful aquamarine sculptured swimming pools in a labyrinth of curved walkways and meandering paths. There is easy access to the sparkling sandy beach and the quaint street markets. An enchanted ambience and smiling attentive staff ensure your visit to Phuket’s playground in the sun is as memorable as it is magical. The Deluxe pool access rooms are located on the ground floor of the new wing, offering direct access to our peaceful swimming pool. These modern rooms with a king-size bed and glass-walled bathroom are perfect for romantic getaways. Superior rooms offer a high level of comfort. Each room features a comfortable bathroom with shower only. Most of the rooms are non-smoking rooms, but smoking at the balcony is possible. However, the rooms on the ground and second floor of building no. 4 are prohibited smoking at the balcony. Extra bed is available at a supplement rate. Maximum 2 adults and 1 child, or 3 adults. Pool View or Non-Pool View. The Deluxe rooms are tastefully decorated in modern style. Each room features a comfortable bathroom. All rooms are non smoking rooms, but smoking at balcony is possible. The splendid Junior Suite is your home away from home in the heart of Patong. The spacious suite has a separate bright and cosy living room and king-size bedroom, all decorated with wooden panels and warm colours for an authentic Thai experience. The modern amenities include a bathtub, free Wi-Fi and a wide range of international television channels. The Executive Suites consist of a bedroom with a king size bed, a living room, and two bathrooms. All rooms are non smoking rooms, but smoking at balcony is possible. The Presidential Suite consists of 1 bedroom with a king size bed and 1 bedroom with 2 single size bed, a spacious open-plan living room with living room, and two bathrooms. The room is non smoking room, but smoking at balcony is possible. Maximum 4 adults and 1 child.